The Horror Honeys: Kirk Von Hammett's Fear FestEvil! Kirk Von Hammett's Fear FestEvil! 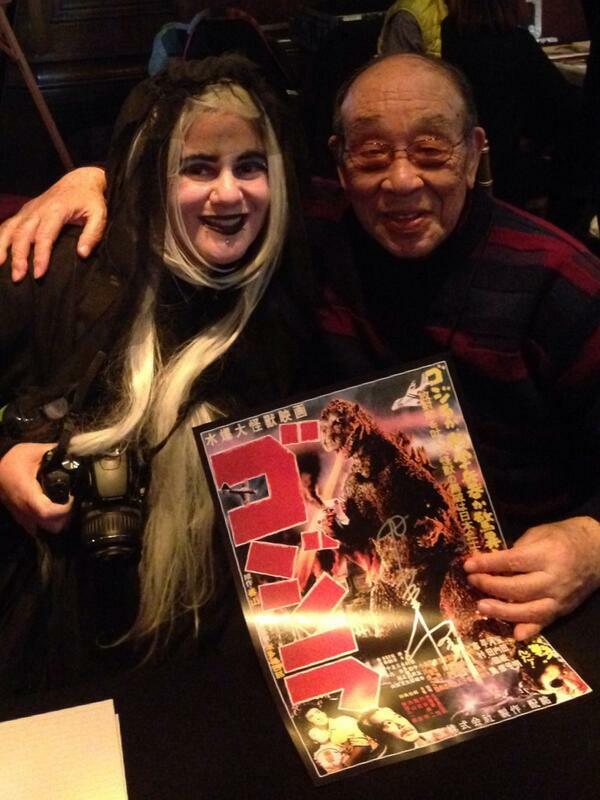 Last year, I went to Kirk Von Hammett’s book signing and show at Public Works. This was the first time I’d heard about his epic horror collection and it was also the first time I really wanted to be filthy rich so I could have my own Hellraiser mask. When tickets for FearFestEvil were posted, there would be no question I would be front and centre. Kirk Von Hammett had reinvented the peanut butter cup, but one made for me: Horror and metal, two great tastes, that taste great together. 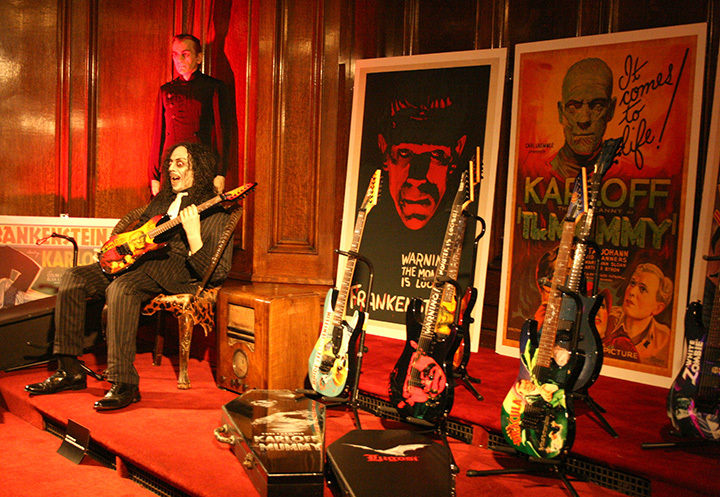 A wax Kirk Hammett poses with his monster guitars. I knew I would dress up for the event. At 5’2”, I almost went with the Chucky Doll, but I wanted to give a nod to some great, new horror movies, so I was the scary, old hag from Insidious. As I entered The Regency, I was blown away, immediately. All the floors were open. On the main floor, Scott Ian of Anthrax was being transformed into Jack the Ripper over the course of 5 hours. It was surreal to hear his iconic voice coming through the mask of a madman. The rest of room was filled with vendors, bands signing autographs and guitars that looked like monsters. 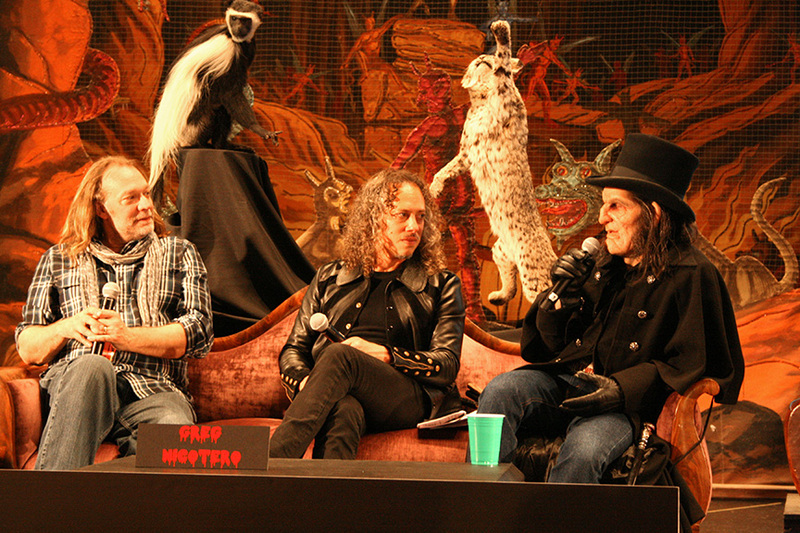 Greg Nicotero, Kirk Von Hammett, and Scott Ian as Jack the Ripper! I headed downstairs to the booths and was greeted by the infamous Derek Riggs, creator of Iron Maiden’s infamous mascot, Ed the Head. Mr. Riggs was quite the prankster and posed for many pictures while people photobombed us. You didn’t have to wander far to meet another icon. Doyle, of The Misfits and Gorgeous Frankenstein, was sitting at the very next booth. Only one booth away sits Jon Schnepp who has had his fingers in everything, including Metalocalypse, the Venture Bros. and Aqua Teen Hunger Force. He also directed and wrote the “W is for WTF?” portion of ABC’s of Death. Don't steal my bike! Props from The Walking Dead. At night, the main ballroom emptied of vendors to host a feast of metal. Carcass, Orchid, Death Division, Death Angel and Exodus added the soundtrack to the weekend. We were treated to a special rendition of Blue Oyster Cult’s “Godzilla,” when Kirk Hammett joined Exodus and a giant, dancing Godzilla on stage. At another panel, I was able to ask Doyle, Slash, Kerry King and Kirk Hammett about Italian horror. While they all love Suspiria and Black Sunday, I found out Kirk Hammett, Greg Nicotero and I all have a soft spot in our black hearts for the shark-fights-zombie scene in Lucio Fulci’s “Zombi.” After the panel, I showed the rock gods my Suspiria tattoo. To seal the weekend with some real blood, my friend and I headed downstairs to L.A. Ink’s Amy Nicoletto, to seal the weekend with fresh ink! A Deadite from Army of Darkness!! 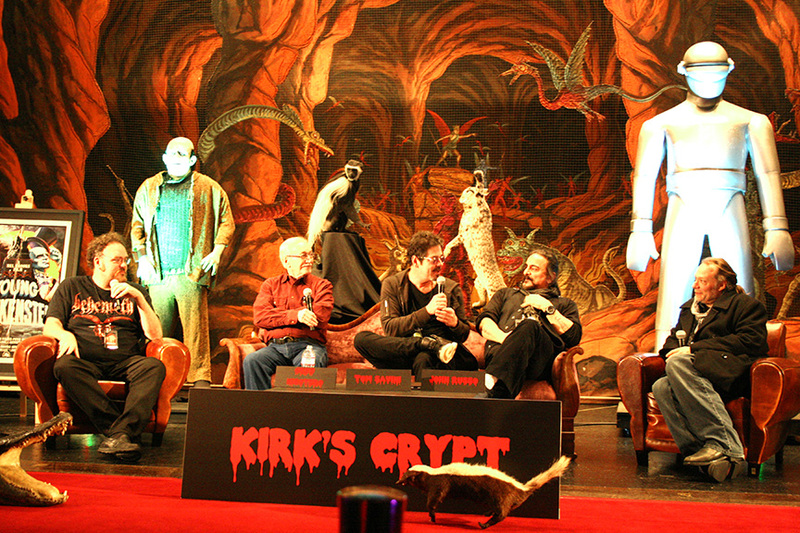 In between amazing panels, you could spend your time walking around Kirk’s Crypt to admire his vast collection. 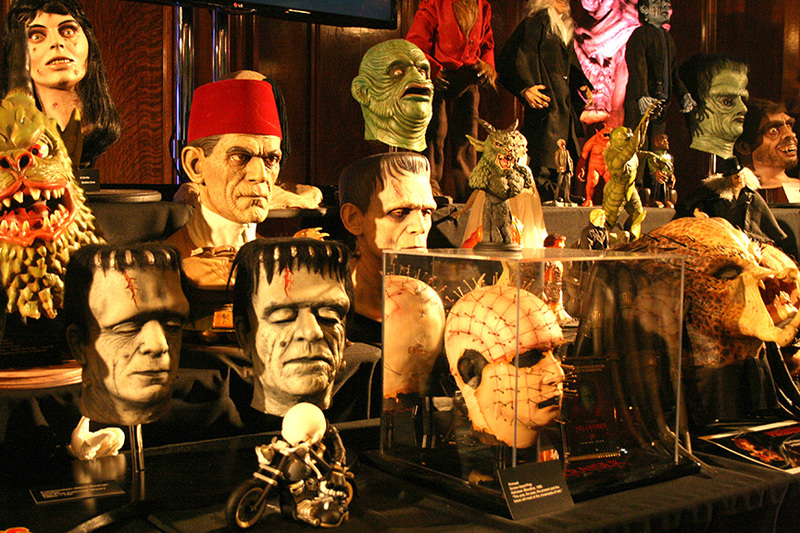 About 100 masks lined one wall, from all the horror classics, while full-sized creatures loomed against the other wall, where legendary artist, Basil Gogos sat signing pictures. The festival was dedicated to this man who turned black and white creatures into full color images to the delight of generations. Later, Kirk Von Hammett proudly presented him with a special award in his honor. Much like myself, I think he wanted to cry with happiness. Three iconic horror monsters lurk in Kurt's Crypt!